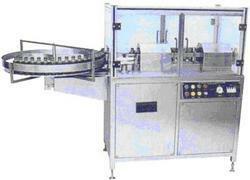 Our range of products include automatic bottle air jet cleaning machine. We are engaged in manufacturing, exporting and supplying of quality Automatic Vertical Air Jet Cleaning Machine. These work on positive air pressure & vacuum cleaning. The unit is made compact, versatile and enclosed in stainless steel elegantly matte finish body, consists of S.S. Slat Conveyor & Reciprocating cleaning nozzles. No container, no cleaning system arrangement is standard features of the machine. These are available at very reasonable price in market. Looking for Bottle Air Jet Cleaning Machine ?